Hendy 281 Hobo был построен в единственном экземпляре в Шорхэме, графство Сассекс, в 1929 году. Это был одноместный моноплан с низкорасположенным крылом и открытой пилотской кабиной. Первый полет он совершил в октябре 1929 года. ALTHOUGH he has had to work under somewhat unfavourable conditions, Mr. Basil B. Henderson, Managing Director of the Hendy Aircraft Co., of Shoreham, Sussex, completed the little single-seater light 'plane, which he calls the "Hendy Hobo," about a month ago. 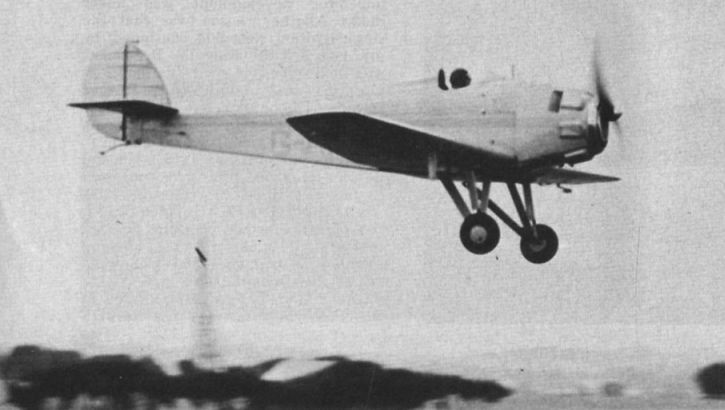 On its first test flight, Mr. Percival took the machine straight off the ground without any preliminary straights, and found it to answer the controls perfectly. So much so that, already on this first flight, the pilot flew the machine "handsoff." 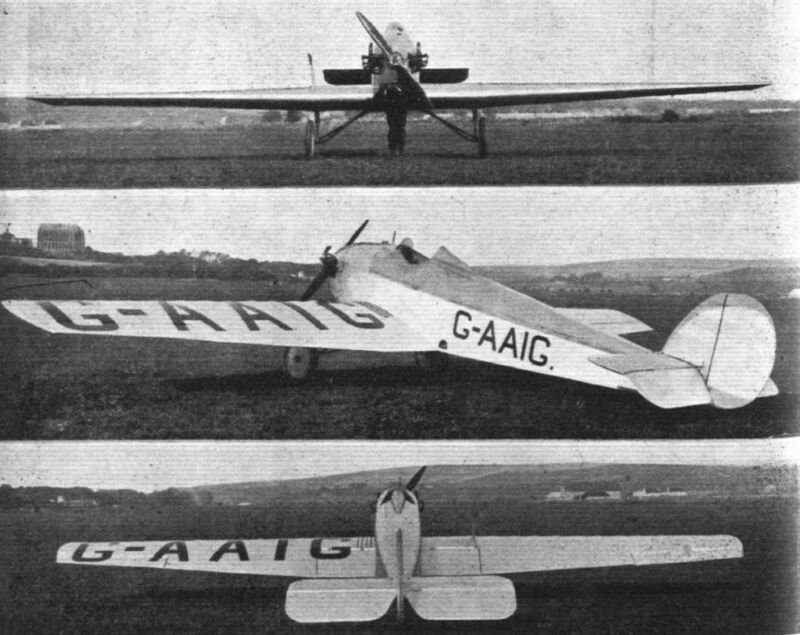 The general features of the machine can be seen in the photographs, and it will be observed that the "Hendy Hobo" is a low-wing cantilever monoplane. 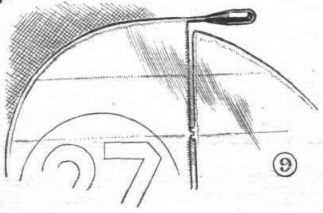 The wing is designed to fold, and the two halves of the undercarriage support the wing roots. Owing to the wide track, the machine can be taxied about on the ground in very small circles without turning over. The engine is an A.B.C. "Scorpion," which has been found to run extremely smoothly. ANOTHER machine of the smaller class of private owners' aircraft, which has been recently designed, is the Hendy Hobo. The chief idea of this type of machine is that it should provide people with a means of flying at a minimum of cost. Whether or not this type will have a wide appeal is one of the many points which may be decided during the forthcoming season, but on the face of it, it certainly would appear that there must be a demand for a small, very cheap, single-seater machine. There should be many who wish to qualify for their “B" licences, a matter which necessitates a minimum of 100 flying hours as an "A" licensed pilot, and these hours could well be put in on such a machine; and then for the man who has neither the time nor money to make long cross-country journeys in a larger and more costly machine, such a machine as the Hobo would enable him to fly from his own aerodrome, and to get the benefit of being in the air at even a cheaper cost than running a motor-cycle. The Hobo has many novel features, and though not yet in production it promises to be eminently suited to this sort of work. It is robustly built with three-ply wood covered fuselage, so that there should be no trouble with it getting easily damaged. The undercarriage is very wide, and the machine is exceptionally stable on the ground when standing in a wind or when taxying. The engine is the simple and well-tried-out A.B.C. Scorpion of 35 h.p., and though only fitted with one double-spark magneto it has proved quite reliable. 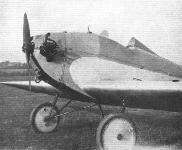 The Hobo was built by the Hendy Aircraft Co., Shoreham-by-Sea, Sussex, on the aerodrome of the Southern Aircraft Co., Ltd.
View of the Hobo in its original form, with 35 h.p. ABC Scorpion engine and large Palmer aero wheels. 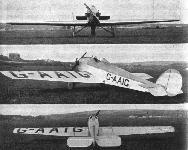 The three photographs right show the Hobo at Shoreham in 1929, around the time of the first flight. The Hobo immediately after modifications which included re-engining with a Pobjoy R engine, different undercarriage and the fitting of mass balances to the ailerons and rudder. The Hobo at Lympne, in later life. The "Hobo" and the "Heck." 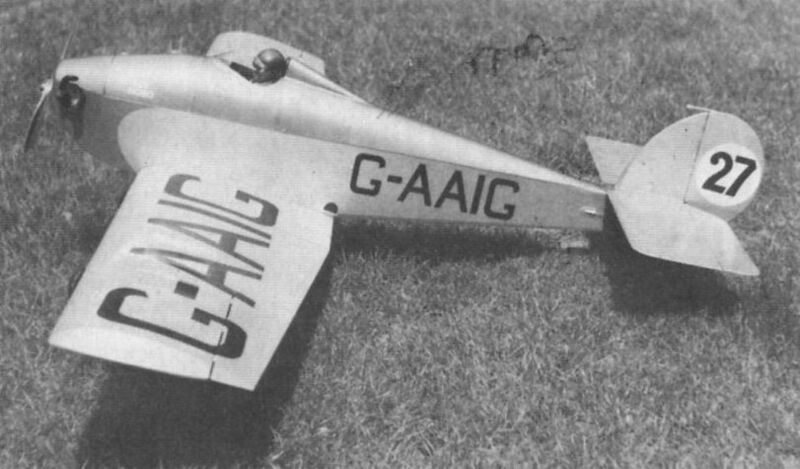 The Hobo after extensive modification, painted in the colours of Aircraft Exchange & Mart, at Hanworth. Scratch and subscratch: Lord Patrick Crichton-Stuart (Hendy Hobo) awaits the fall of the flag in the final of the Folkestone Aero Trophy race, while Captain Percival prepares to start his Mew Gull, which had another ten minutes to wait. Lord Patrick Crichton-Stuart in his Hobo at Lympne. The aircraft was registered in his name on July 20, 1935, and based at Hanworth. 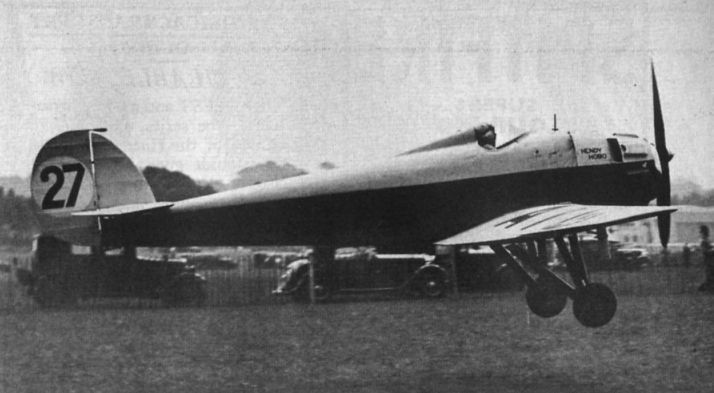 Picture shows A. L. T. Naish flying the Hendy Hobo in the 1934 King’s Cup Air Race at Hatfield. 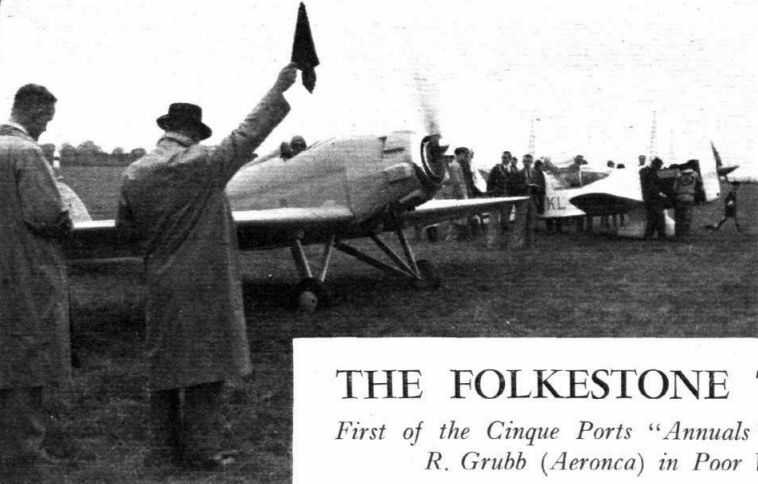 Another view of the Hobo at Hatfield during the 1934 King’s Cup Air Race. Fuel shortage brought about a forced landing at Reading and put the Hobo out of the race. 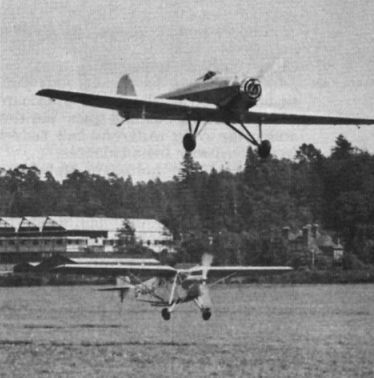 The Hobo leaving Brooklands for Newcastle, hotly pursued by a D.H. Leopard Moth, on August 11, 1934. 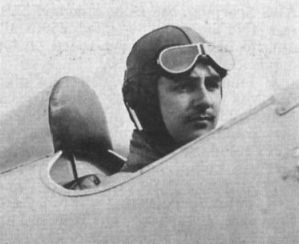 Lord Patrick Crichton-Stuart at the controls of the Hobo on the occasion of the London-Cardiff Race, at Heston in September 1935. DESIGN AIDS TO SPEED (9) The mass balance on the rudder of the Hendy "Hobo."